Portfolio company: Advenira Enterprises, Inc. The enterprise located in the territory of KhimGrad technological park started production of chemical agents for application of multi-field coatings. Potential clients include machinery, pipe and aerospace companies of the country. Advenira Enterprises, Inc. has been founded in 2010 in the Silicon Valley by a group of Russian specialists headed by Elmira Ryabova. In December 2011, RUSNANO has become one of the company’s shareholders and up to this day it has invested more than RUB 1 bln. Advenira develops both the coating equipment and precursors (chemicals, solutions). Advenira creates anticorrosive coatings for oil and gas, automotive and machine-building industries, protective coatings for touch screens, automobile and energy-saving glasses as well as for solar batteries. The volume of the global market of coatings makes more than $50 bln and about a half falls on anticorrosive coatings. The company’s know-how protected by a number of patents allows to apply films on large and complex objects of almost any composition whether it be glass, metal, plastic or even wood. The major part of the existing coating application processes requires deep vacuum and high temperature for precipitation, which is associated with high energy consumption. The patented films of Advenira are cost effective as they are used at room temperature and atmospheric pressure on a high performance conveyor line. This results in plant cost reduction (by 3-5 times) and reduction of the cost of a square meter of coating (up to 10 times) due to high performance, efficiency and low energy consumption, as well as better characteristics of the coatings (transparency, barrier properties, erosion resistance, etc.) in comparison with other application methods. “Six years ago, when we saw the work of Elmira Anatolyevna Ryabova in the Silicon Valley we were highly impressed. To say the truth, by that time it were several cans with something boiling and bubbling inside. And it wasn’t something very large. But the essence of that technology is amazing. This is about coatings that do not require vacuum and high temperature for application. The main know-hows are the composition and the method of application. The range of application and the surfaces is very broad, and the potential of that technology is great. A minor production with the capacity of 30 thousand litres per year is being launched at the moment. The next step is 300 thousand litres. The potential consumers range from automotive industry, including KAMAZ Group (we are conducting negotiations with it), to petrochemical industry, covering of bridges and even monuments”, said the Chairman of the Board of MC RUSNANO, Anatoly Chubais. Advenira launches a site in the territory of KhimGrad technological park for production of chemical agents (precursors) for coatings. It is planned that in the near future the equipment for application of coatings will be installed at the same site. At the first stage, the volume of chemical agents’ production will not exceed 30 thousand litres per year, but subsequently the volume will be increased 10 times. Advenira’s products and services have already aroused the interest of a number of Russian players from several industries that intend to use the company’s coatings for extension of service life of their products and reduction of costs. 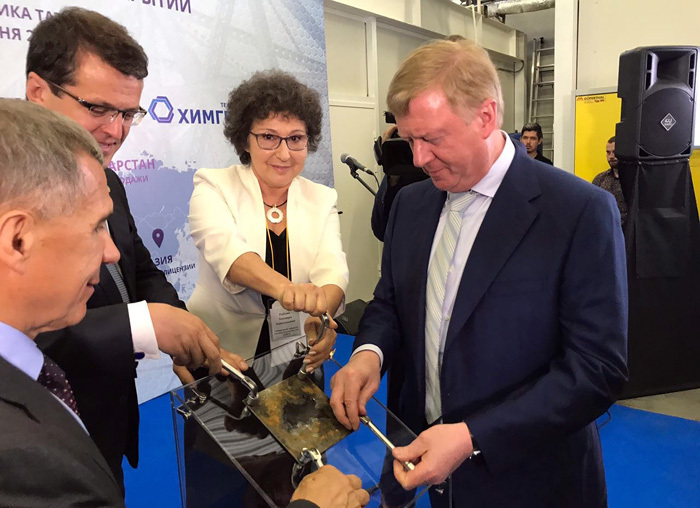 In particular, the company signed agreements of intent with OZ company, which produces anticorrosive and fire retardant coatings for metal structures and concrete, with Milandr—leading Russian developer and manufacturer of integrated circuits, and with RMA Rus—manufacturer of stop valves for pipelines. “The market of functional and protective coatings is growing incredibly fast. This is explained by the companies’ endeavours not only to reduce costs by extending the service life of their products and to extend the range their properties, but also to minimize the negative effect of industry on the environment. Advenira is trying to solve these two problems. And, as far as we can see, Elmira Ryabova’s company has achieved tangible results. For that reason, we in OZ believe that our joint efforts in development of coatings and their application technologies will let us generate a technological solution allowing to ensure a durable protection of our customers’ products, while preserving non-renewable natural resources and the ecosphere of the Earth”, said the General Director of OZ GROUP LLC, Grigory Shifrin. In March 2016, Advenira established its first enterprise in Russia, in the territory of New Moscow, Troitsk, at the site of TechnoSpark nanotechnological center. The aim of Advenira center is the promotion of nanocomposite materials at the Russian market by means of implementation of functional coatings in various industries. The center has nanotechnological equipment for precision and uniform application thin films with thickness of 3 to 10 microns and more heavy coatings (up to 100 microns) on plain bases and details with complex geometry. The center uses necessary equipment for preparation of surface before application of coatings and laboratory instruments for control over the characteristics coating solutions. Currently, there are several standard approaches to application of functional nanocomposite films. This is physical vapour deposition (PVD), chemical vapour deposition (CVD) and some methods for a limited number of liquids, in particular, sol-gel process, which ensures unique advantages, but is not widely used due to significant shortcomings where the short life of precursor solutions is the main one. The SDN (Solution Derived Nanocomposite) technology is a modification of the sol-gel method that has overcome problems maintaining the precursor solution in its initial state.